Our product range includes a wide range of oil free scroll compressor and scroll compressor. The multi-stage control offers optimal operation and energy savings. Multi-stage control is adopted to supply compressed air with an optimal number of compressors. The system may be configured flexibly using SLP compressors alone or a combination of different compressors. The 22-kW and 30-kW models feature an easy-to-operate touch panel. The ThinkAir Series compressors (22 kW/30 kW) received the Excellent Product Award in fiscal 2004 from the General-Purpose Compressor Committee of the Pneumatic and Hydraulic Machinery Working Group of the Japan Society of Industrial Machinery Manufacturers. The system may contain two to eight compressors and motors. Multi-stage control is adopted to use an optimal number of compressors according to the amount of air used. 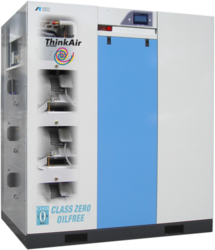 The ThinkAir Series compressors eliminates wasteful operation to save energy. When air consumption fluctuates, the control method of the compressor makes a big difference. The ThinkAir Series compressors minimize power consumption to offer huge energy savings. With conventional compressors, the unload time when compression is not occurring is also counted when the maintenance cycle is decided. 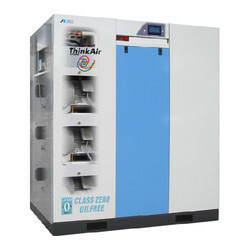 The ThinkAir Series compressor is newly designed to calculate the load factor of the entire compressor system based on the operating/stop status of each of the multiple units mounted and change the operation time according to this load factor. This makes it possible to plan maintenance according to the actual compression time, leading to a reduction in maintenance cost. Since it is of a low-noise, low-vibration type, the compressor can be installed in the site as well. It can be used at ease in residential areas and during nighttime. It also helps to meet noise regulations. If one compressor fails, the other multiple compressors mounted in the system start backup operation, preventing the supply of compressed air from being interrupted.